Yes, another Spurgeon book! I can't help it. I really like reading Spurgeon. This one is quite unique because it is a compilation of 26 "Pastoral Prayers." The Pastor's prayer was a prelude to the sermon. It was lengthy. I am not sure who exactly wasn't engaged in prayer while transcribing the prayer, but I am glad to get an insight into the Preacher's prayer-life. 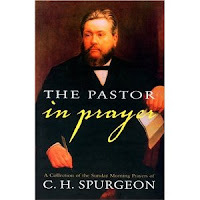 If you think his sermons are worth reading, then you must read his prayers. They are insightful as they are convicting (if I may say so). I will try to highlight excerpts that rung a bell with me on my Twitter page (assuming I can keep it to 140 characters), and if not, I shall share the longer ones on my main blog. At any rate, this book is a worthy read. Published by: Ambassador (Ambassador Classics) - My edition happens to be an older one. However, a 2nd edition is published by Banner of Truth (in Hardback - as seen in the picture above). No Kindle edition, to my knowledge, how unfortunate. Paperback, 164 pages of good stuff.